One of the hottest subjects in industrial recycling has always been tire recycling. Many companies have made fortunes in this domain and contrary to popular belief the supply of used tires is still growing. This being said, many companies also went bust gambling on tire recycling ventures. The main reasons being the lack of preparation, the lack of funding and wrong choice of equipment. Tire recycling is not rocket science, nor is it as simple as house painting. Most problems can be avoided with common sense, but most importantly, you need to choose the right supplier for your equipment. Our company has installed more successful tire recycling facilities than any other manufacturer in the world. As the developers of most of the technology being used today in this field, we have the all the experience and resources needed to build functional and profitable tire recycling plants. Before even discussing how tires are processed, let us pay attention to what is valuable in the tires. Tires are composed of three materials: Vulcanized Rubber, Steel and Fiber. These materials are valuable, and one of them has a variable value depending on its final size. One of the neglected profit components of the tire is the steel it contains. This steel is 98% rubber free when processed through our Rasper. This material can be processed further through our vertical grinder to become completely rubber free. If briquetted or baled, the tire wire can account for as much as 50% of the income generated from a tire recycling operation. 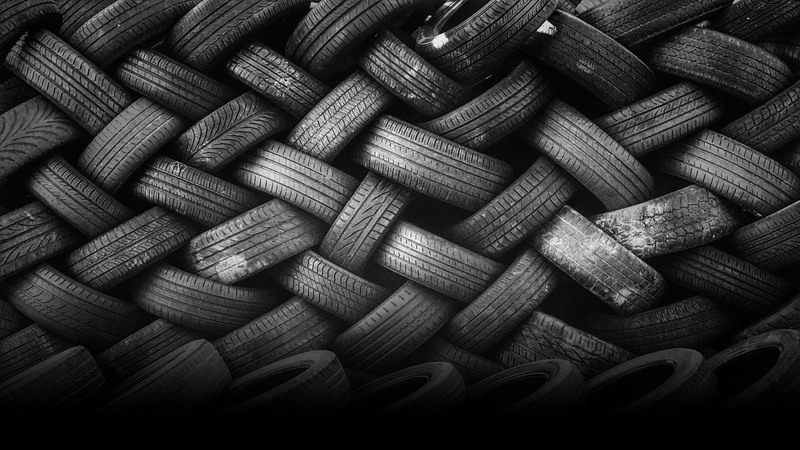 The Rubber and the steel are the obvious money makers in tire recycling. Their value will depend on the final size and purity of the end product. The typical rubber sizes that are sold on the global markets are: 2″ (50mm) chips, known as TDF (Tire Derived Fuel), <1/2″ (<12mm) wire free granules and 5 to 100 Mesh rubber crumb. The term crumb refers to fine rubber sized products. Crumb sizing is determined by the number of screening holes per square inch. So 25 mesh rubber crumb, as an example, would be screened using 25 holes per square inch. So 25 mesh rubber crumb is about 1/25ft of an inch of vulcanizes tire rubber. The first part of the recycling process consists of shredding the tires to a 2″ (50mm) chip. This is accomplished with shear shredders. The number of shredders required depends on the hourly tonnage that you will be processing. For low tonnage operations, a single medium sized shredder like our 5444 with a recirculation system will suffice. High tonnage systems will use shredding lines with a gradual cut and a final screen. These chips are often called TDF (tire derived fuel) because they can be used as fuel for industrial kilns just like the ones found at a power plant or a cement kiln. Once we have obtained a TDF particle size, we can move onto the Rasper stage of the process. The Rasper is a machine that is built by only 4 manufacturers in the world. Through experimentation and experience, we have all determined that a single Rasper, or Rasper type machine, will have an output of <1/2″ wire free rubber and 98% clean steel when fed with a <50mm tire chip. These machines come in various sizes and therefore various capacities. At this stage, the end product can be painted and used for landscaping material. It’s also referred to as a rubber mulch. Now we can move on to the production of rubber crumb. This task is accomplished by Granulators and crackermills. These are cutting machines that will slice and dice the 12mm wire free down to a 10 to 40 Mesh range. Once this is done, the material needs to be screened to separate the different sizes that are produced and to remove the fiber. In order to obtain a fiber free product, the rubber must be cut down to a minimum of a 10 mesh particle size. The steel removal begins in the Rasper stage and is removed by magnets. Every tire recycling project is different. No two businesses will produce the same end product and the same production rate simply because a tire recycling plant is dependant on the market it caters to. Some operations will specialize in TDF , others in fine crumb while another operations specialize in the mulch business. Each venture also depends on the local tire supply. – Find a building with proper zoning. – Obtain the proper permits. The permitting stage can take between six months and up to two years. – Establish a tire supply contract. – Study your local market to find buyers for your end product. Review the sale of your end products. – Move to an engineering stage to select a system design. Previous PostPrevious Who invented the shredder?